The GW Radiation Oncology Center provides advanced diagnostic and medical treatment for cancer patients who come from both near and far. Our dedicated and supportive staff provides every patient with personalized world-class medical care, and our highly-advanced medical technology allows physicians to employ many of the latest medical treatment techniques, such as Intensity Modulated Radiation Therapy, Image-Guided Radiation Therapy and RapidArc™ Image Guided IMRT, to treat your disease. Patient navigators to help you through the treatment process. Learn more about patient navigators. 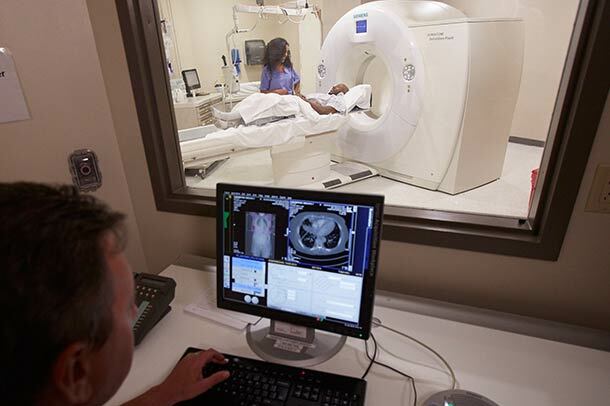 At the GW Radiation Oncology Center, our advanced imaging and radiosurgery technology allows our staff to employ many of the latest techniques to diagnose and treat cancer.